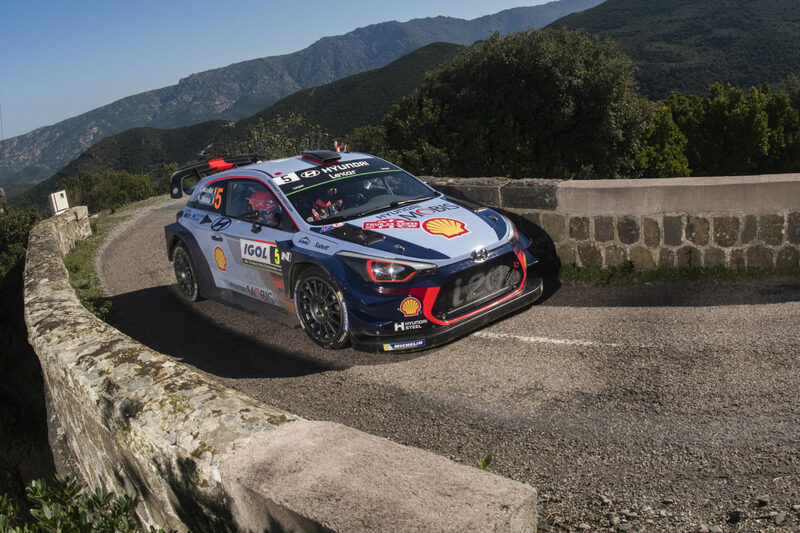 THIERRY Neuville has taken a commanding lead in the Che Guevara Energy Drink Tour de Corse and put Hyundai in position to become the fourth different manufacturer to win in the first four rounds of the 2017 FIA World Rally Championship. After a dramatic second leg on Saturday, the Belgian will start Sunday’s finale with a 38.9sec advantage over Sébastien Ogier, after mechanical troubles sidelined Kris Meeke from the lead and blunted Ogier’s attack. Neuville will hope history does not repeat itself on Sunday. He crashed his Hyundai i20 Coupe while leading in the opening two rounds in Monte-Carlo and Sweden. M-Sport Ford driver Ogier went on to win in Monte-Carlo and Toyota’s Jari-Matti Latvala in Sweden, while Meeke won for Citroen in Mexico. On Saturday, Neuville won three of the four asphalt speed tests in the mountains of northern Corsica, leapfrogging both Meeke and Ogier in the morning’s second test. Meeke’s 16sec lead was wiped out as his Citroën C3 coasted to the finish with smoke billowing from its engine. With Ogier struggling to find a good feeling in his Ford Fiesta, Neuville swept into a near-10sec lead. Meeke will not rejoin the rally on Sunday, but said he took confidence from Citroën’s performance. “In order for a car to go as fast as possible, there are tens of people who work on thousands of parts and sometimes, it doesn’t work quite as it should. In any event, this weekend has given me a huge confidence boost for the future. It was really special to lead this rally, which I think is the most difficult tarmac event,” the Northern Irishman said. A rejuvenated Ogier regained much of the gap to Neuville in the opening afternoon test after set-up changes transformed his car’s handling, only for hydraulic problems to leave him limping through the final stage. “We were able to set good times today, we were very strong. I pushed hard in the final stage to try to increase the lead a bit more and then Ogier had his problem. Tomorrow will be tough, though,” Neuville said. Ogier had kept his troubles a secret. “At the end of SS7 we lost hydraulic pressure so I knew the problem was starting. The target was to finish the day and get back to service. We had no gearshift and no differentials so it was like a proper rear-wheel drive car,” he said. Dani Sordo climbed to third in another i20, almost a minute off the lead. The Spaniard remained frustrated, confident in his driving, but disappointed with his times. He was 11.7sec ahead of Jari-Matti Latvala, whose pace improved when he changed the transmission set-up on his Toyota Yaris. Both Sordo and Latvala overhauled Craig Breen, who drove one stage with no pace notes after intercom failure. Hayden Paddon completed the top six in an i20, admitting he was in ‘no man’s land’ with large time gaps in front and behind. Rally Australia 2016 winner Andreas Mikkelsen was seventh outright and led the WRC2 field by more than a minute in a factory Skoda R5. Sunday’s final leg comprises just two stages before the finish in Porto-Vecchio, but features a sting in the tail. It opens with the longest test of the weekend, a marathon 53.78km, before the Power Stage finale, with bonus points for the fastest five drivers.